I’ve tried 4 pizza crusts recipes so far and have been baking pizzas for over a year now (drum roll please!)) and the one I’m going to share with you today is the best one out of all the recipes I’ve tried till date. Who doesn’t love pizza ? I’ve yet to come across a person who doesn’t love pizza. Actually I did but that person also loves it now! My mother-in-law didn’t like pizza but after I’ve started making pizza at home, she loves to enjoy pizza dinners. The secret is in the crust. She didn’t like those hefty and bulky white under baked crusts. She likes a crisp, nicely browned crust no matter thick or thin. Well, it’s probably the only thing we both agree on (:p) !! So getting on the recipe, try this recipe if you are a beginner in pizza making. Because a good and trusted pizza crust/dough recipe will save you a lot of frustration in your initial tries. 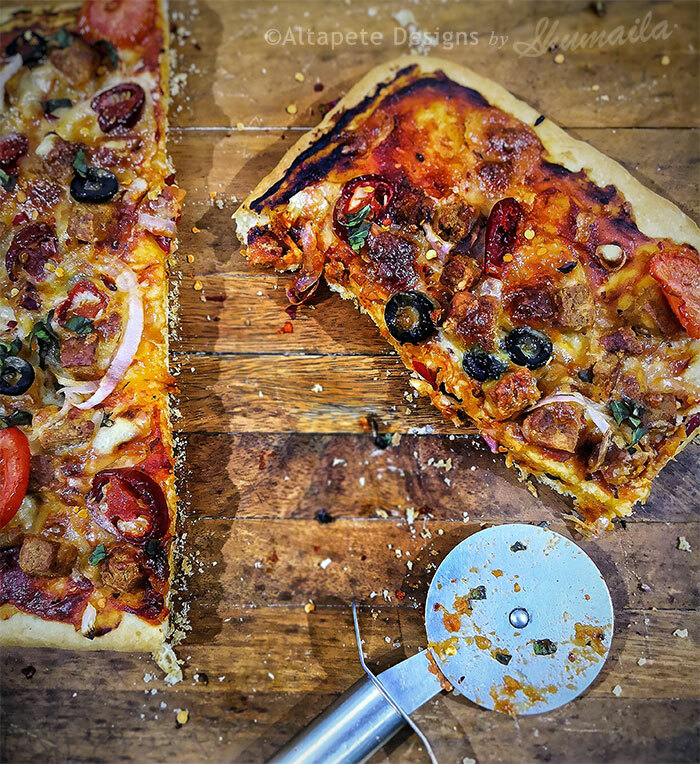 You may also like to start with a no-knead dough recipe which I totally recommend because when you are new to pizza baking, prepping for the toppings and managing time for dough rising and oven temps may seem like a lot of work. I will also post my favorite no-knead pizza crust/dough recipe but until then you can try this recipe on my guarantee. Please make sure you read the recipe carefully a few times before starting on. This pizza crust recipe will make a signature crisp bottom and soft top texture (my tummy just grumbled while writing this). The flavor is amazing and you probably would not want to overdo the toppings to enjoy the crust. 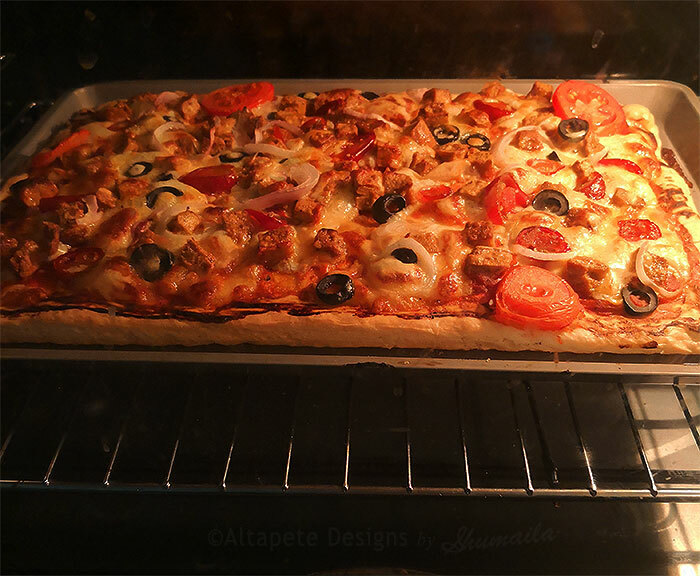 If you are someone like me who likes to enjoy flavorful pizza crust, you could top half of the pan with good amount of toppings and keep the other half simple with just sauce and cheese topped with lots and lots of basils (if you are a basil girl like me!). This recipe will produce one rectangular 13x 18 size medium crust pizza (about 1 inch). If you're using active dry yeast, dissolve it, with a pinch of sugar, in 2 tablespoons of the lukewarm water. Let the yeast and water sit at room temperature for 15 minutes, until the mixture has bubbled and expanded. If you're using instant yeast, you can skip this step. Combine the dissolved yeast (or the instant yeast) with the remainder of the ingredients. Mix and knead everything together—by hand, mixer or bread machine set on the dough cycle—till you've made a soft, smooth dough. If you're kneading in a stand mixer, it should take 4 to 5 minutes at second speed, and the dough should barely clean the sides of the bowl, perhaps sticking a bit at the bottom. Don't over-knead the dough; it should hold together, but can still look fairly rough on the surface. Place the dough in a lightly greased bowl, cover the bowl, and allow it to rise till it's very puffy. This will take about an hour using instant yeast, or 90 minutes using active dry. If it takes longer, that's OK; just give it some extra time. Allow the dough to rest, covered with an overturned bowl or lightly greased plastic wrap, for 15 minutes. Use vegetable oil or non-stick pan spray to lightly grease the cookie sheet. Drizzle olive oil into the bottom of the pan. The pan spray keeps the pizza from sticking; the olive oil gives the crust great flavor and crunch. Place the dough in the prepared pan. Press it over the bottom of the pan, stretching it towards the edges. You'll probably get about two-thirds of the way there before the dough starts shrinking back; walk away for 15 minutes. Cover the dough while you're away, so it doesn't dry out. When you come back, you should be able to pat the dough closer to the corners of the pan. Repeat the rest and dough-stretch one more time, if necessary; your goal is to get the dough to fill the pan as fully as possible. Allow the dough to rise, covered, till it's noticeably puffy, about 90 minutes. Towards the end of the rising time, preheat the oven to 450°F. Bake the pizza on the lower oven rack till it looks and feels set on top, and is just beginning to brown around the edge of the crust, but is still pale on top. This will take about 12 to 14 minutes. If you're baking two pizzas, reverse them in the oven (top to bottom, bottom to top) midway through the baking period. Remove it from the oven, and arrange your toppings of choice on top. Return to the oven, and bake on the upper oven rack for an additional 10 to 15 minutes, until the crust is nicely browned, both top and bottom, and the cheese is melted. Check it midway through, and move it to the bottom rack if the top is browning too much, or the bottom not enough. Your goal is a pizza whose crust is browned, and whose toppings are hot/melted. Remove the pizza from the oven, and transfer it from the pan to a rack to cool slightly before serving. For easiest serving, cut with a pair of scissors.